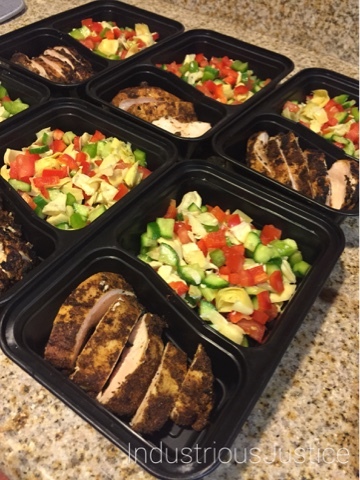 Whole30: Prepping for Round 2! 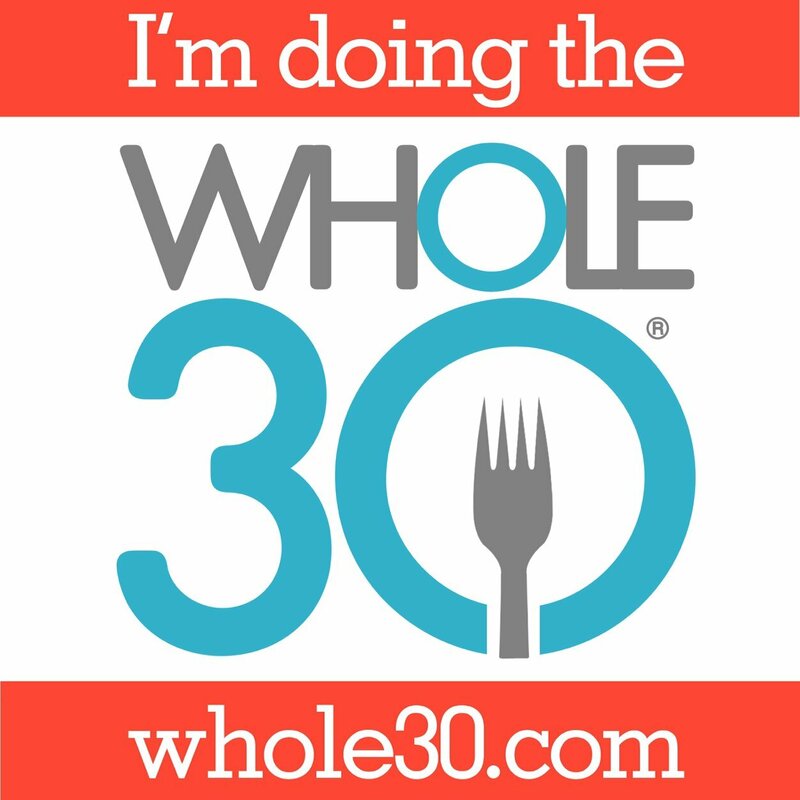 I'm doing my second round of Whole30 from January 2 - 31. (Less than a week away!) I think the best thing about doing a second round of Whole30 is the confidence that comes with knowing that I've made it through the 30 days previously. I can do this. Another great thing about Round 2 is that I know a lot more people doing it this time. A few colleagues, friends, and friends of friends. One of our friends has already coordinated a Whole30 dinner party for mid-way through. As we near the start of Round 2, I've been in planning mode and I've also noticed that I'm getting more questions from people. I thought I would compile a list of tips/reminders for myself and anyone else embarking on this adventure. Failing to plan is planning to fail. I know. It's cliche. It's also the truth. Especially for Whole30. With this in mind, you can't possibly plan for everything that will happen over the course of the 30 days. We plan our meals out about a week in advance. I typically do this on Thursday and then my honey or I go grocery shopping on Friday. 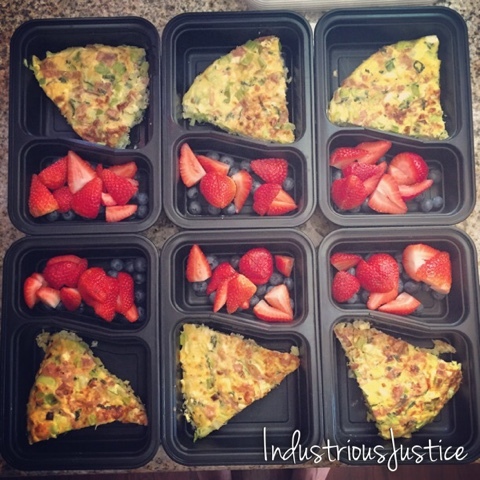 This allows time for food prepping over the weekend. Meal plan, grocery shop, food prep. Rinse and repeat. Having a few "emergency" meals and snacks on hand is important. Our go-to "fast food" is Chomp Sticks and RX Bars. They sell both at our local Trader Joe's. (Just note that not all RX Bar flavors are compliant. Read your labels.) 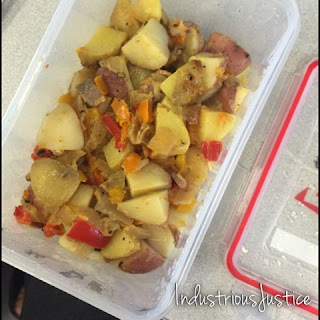 Also, having compliant sausage, a few potatoes, and a green veggie on hand are great for a quick and easy meal. The Best Chicken You Will Ever Eat. Ever. (Well Fed) This goes great with a chopped cucumber, bell pepper, and tomato salad with Primal Kitchen's Greek Vinaigrette. Creamy Spinach Sweet Potato Noodles (Pinch of Yum) This is also vegan! If you do want to add protein, compliant bacon or pancetta would be a nice addition. Crock Pot Picadillo (SkinnyTaste) I enjoy this topped with slices of fresh avocado and with a side of steamed broccoli. 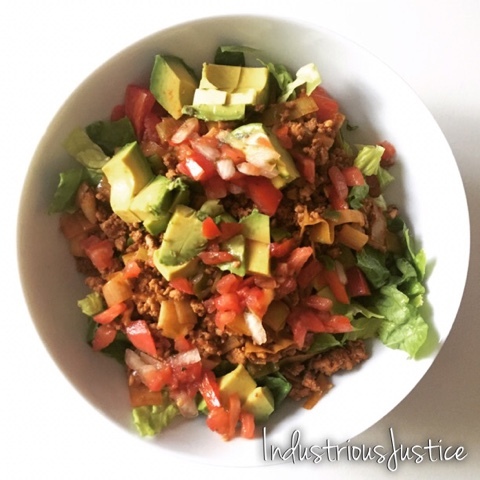 Madras Chicken Salad (Nom Nom Paleo) This is an amazing make-ahead salad. It is super yummy, and fun to eat, in lettuce cups. Oven Baked Meatballs with Marinara (Noshtastic) Spaghetti squash "noodles" works well with this... and I recently figured out how to make it in the slow cooker. Couldn't be any easier! Here's the how-to. Lastly, before you start, don't forget to weigh in, take measurements, and snap some before pictures. That's it. I found the first week to be the most challenging, in that I was so preoccupied with doing the Whole30, what I was eating, what I wasn't eating, what other people were eating, etc. However, once I got through that first week, things got much easier. Take things one day and one week at a time. It's 30 days. Which is not a lot of days in the whole scheme of things. You can do it. If you find yourself struggling, or even if you think it is a breeze, I recommend checking out the Whole30 website. There is more information than you will need there, including a forum where you can find frequently asked questions and support from others. Oh, and Googling "Can I eat on Whole30" is still a frequent Google search for me. Except not with drinking and eating everything you didn't eat while doing the Whole30. That really isn't the point. While Whole30 is not a Whole365, it is an opportunity to shift your relationship with food. Take your time with reintroduction and if you didn't miss something, don't add it back in just because you are now "allowed" to. Take measurements and some after photos. Weigh in, if you'd like. Reflect on the last 30 days and how you feel. Hopefully, we feel a whole lot better than day one. I think we will. Disclosure: Everything above is my own opinion, I paid for all the products with my own cash money, and I am not receiving any sort of compensation. I'm mentioning specific products because they helped me to be successful, and to me that's worth sharing. We eat a lot of zucchini noodles (zoodles) in our house. However, sometimes I want a pasta-substitute with a little more bite to it, a little more structure to hold onto a delicious sauce, and a little less water content to water down said sauce. Enter spaghetti squash. 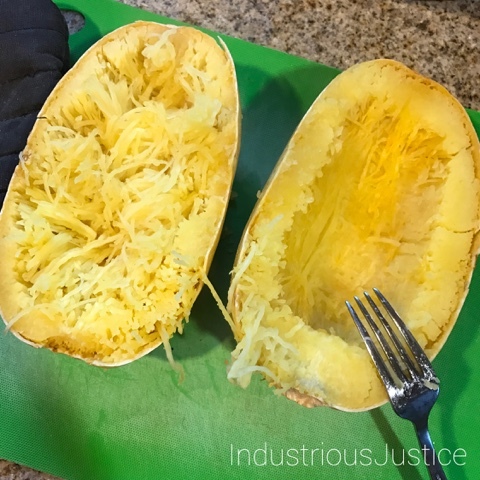 While I'm a fan of spaghetti squash, I always dread cooking it because one of my least favorite things is slicing a spaghetti squash in half to prepare it for roasting. I'm always one slip up away from losing a finger. 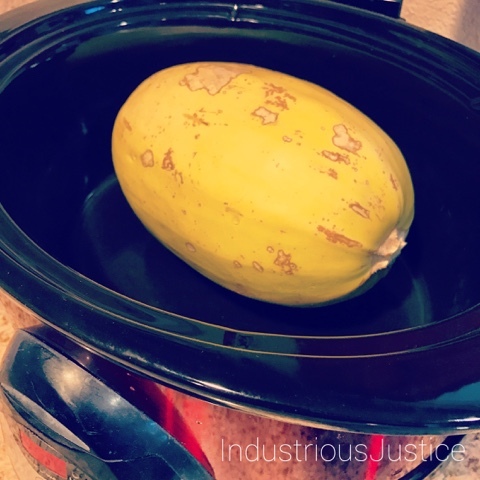 Yesterday, I consulted with Google about the possibility of cooking a spaghetti squash in our slow cooker. People said it could be done. Some recipes called for water, others did not. I decided to try the no-water version, in hopes that it wouldn't get too soggy. Well... I can now add this to the "I can't believe I never tried this before!" list. 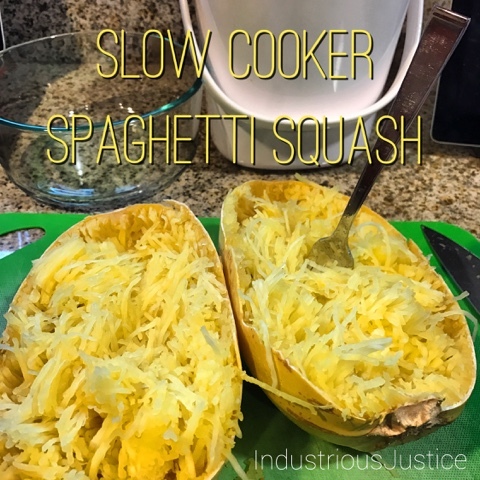 All you need is a spaghetti squash and a slow cooker. Three and a half hours on high was perfect for al dente squash. You will want to keep an eye on yours, as I imagine cooking time varies depending on squash size and slow cooker. I checked mine with a knife and once I was able to insert it fairly easily, I knew it was good to go. If you like softer spaghetti squash, just let it cook longer. Once cooked, it sliced SO easily. I'll be cooking my squash like this from here on out. An ice cream scoop is my seed removal tool of choice. To put the "spaghetti" in spaghetti squash, grab a fork. Our sauce of choice for lunch yesterday was a simple meat ragu from Skinnytaste. Another favorite is Mel Joulwan's (Well Fed) Paleo Pad Thai. Her sunshine sauce is one of the best things ever and we've mixed and matched proteins and green veggies with great success. Really, any sauce you enjoy over pasta works with spaghetti squash. The size of your squash will determine how much cooked squash you get. A large squash will lend ~8 cups cooked squash. 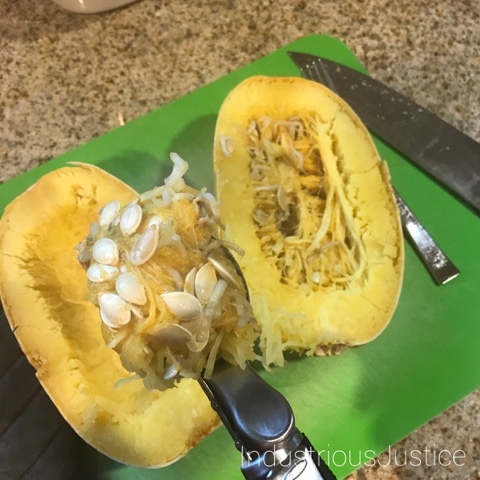 Stab the spaghetti squash a few times with a sharp knife. Cover and cook on high for 3.5 hours. Remove from slow cooker. Slice in half and spoon out seeds. (I like to use an ice cream scoop.) Scrap the squash with a fork to pull out the spaghetti-like strands. Top with your sauce of choice and enjoy! Three and a half years ago, I ran my very first 5K. 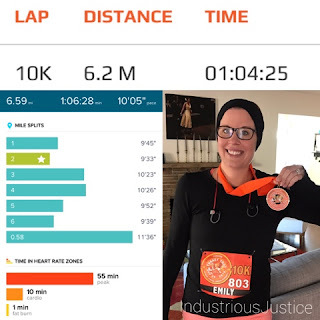 On Thanksgiving, I ran my first 10K! I ran it with my honey and a friend. My primary goal, like most of my runs, was to finish without passing out or throwing up. I also wanted to finish it at an 11-minute mile pace. My honey was thrilled before the race. Obviously. Not only did I fulfill those three goals, my official time was 1:04:25! Well under a 10:30 minute mile pace! My FitBit app was a little more generous. I trust the official time. It was a nice, mostly flat course and a good mix of street and trail. There were lots of volunteers who smiled, cheered, kept the route clear of cars, and provided high fives. 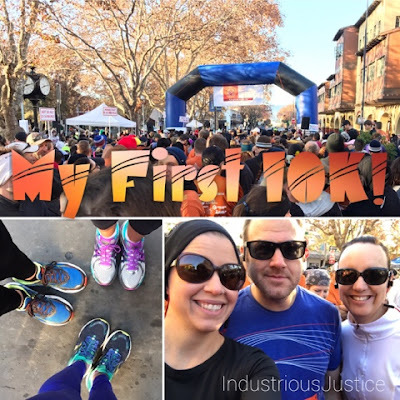 While it was pretty cold out (40º F), I think it was a bit warmer than last year when we did the 5K. I was finally nice and warmed up by 1.5 miles or so in. Also about 2 miles in, I had to do my first bit of walking, because of a side stitch. (Boo!) Happy that it passed quickly and the only other time I did some walking was at the second water stop... and just so I could drink water before picking up my speed again. The 5K and 10K folks all started off together, and at a certain point, we diverged. I felt a great deal of pride veering off towards the 10K part for the first time. I have worked hard for this and I'm glad that I challenged myself to go beyond my 5K comfort zone. Overall, I really enjoyed the run and felt great afterward. I certainly intend to continue this turkey day tradition. After the 10K, I enjoyed stuffing my face at our family friends' house. YUM. When I first started running 5Ks a few people commented, "pretty soon you'll be running half marathons!" I told them to slow their roll. I told them to let me get some 5Ks under my belt. Now that I've got a dozen 5Ks and one 10K checked off my list, I finally see a half marathon on the horizon. Stay tuned for more on my running and racing adventures! Over a month since completing our first round of Whole30, we have carried forward a lot of the concepts. One is eating a good, protein-rich breakfast. During the work week, I typically eat a couple hard boiled eggs and a piece of fruit. I prep a big batch of hard boiled eggs on Sunday, which gets me through the week. 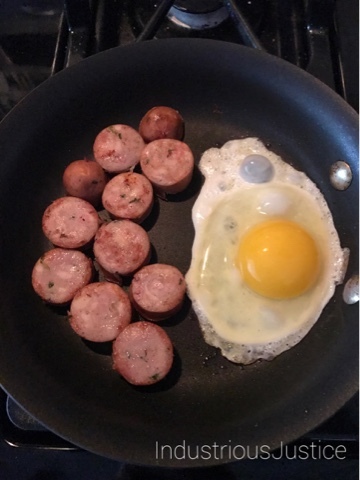 On the weekends, I sometimes "splurge" and cook up a sausage and egg dish. The great part is, it takes all of 10 minutes to make. Tops. Especially easy and tasty after a long run. The ingredients and directions below are for one person. Just scale it up if you're cooking for more than one. Heat a small skillet over medium-high heat. Add sausage and cook, stirring occasionally, until starting to brown, a few minutes. Drop heat to medium-low and push the sausage to one side of the pan. Add ghee to the now empty side. Carefully pour in the egg(s), tilting the pan slightly for a few seconds to keep it away from the sausage. Season egg with black pepper. Let egg cook over the heat for a minute, until bottom is set. Carefully slide the sausage and eggs to a plate and add the tomato/fruit. Sprinkle tomato with salt and top sausage and eggs with mustard and hot sauce, if desired. 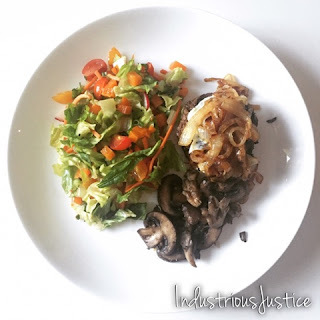 Whole 30 Recap & Results! I did it! I finished my first Whole30! Overall, I feel great and I'm proud that I stuck with it. 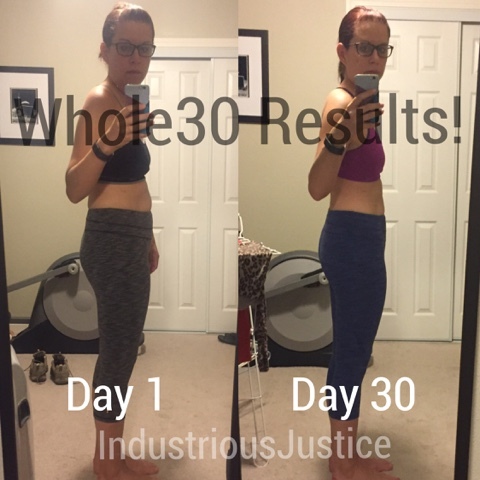 I thought I would do a quick recap and share some of my results, as well as a few tips in case you are reading this because you are considering doing a Whole30 yourself. A quick disclaimer that everything here is my own opinion, I paid for all the products with my own cash money, and I am not receiving any sort of compensation. I'm mentioning specific products because they helped me to be successful, and to me that's worth sharing. Why I Did It: Three and half years ago, I was the unhealthiest I'd ever been (and will be). I started following fitness-focused people on Instagram, people who openly shared their health journey, successes and challenges, and I was inspired to make positive changes in my own life. I started a Couch-to-5K app. We started eating more lean meats and veggies and fruit and less processed foods. Within a few months, I lost ~40 pounds. While I have been successful in maintaining my weight loss, I started to feel ready for another challenge. I started hearing friends and colleagues talk about Whole30 and I started following more Whole30 peeps on Instagram. 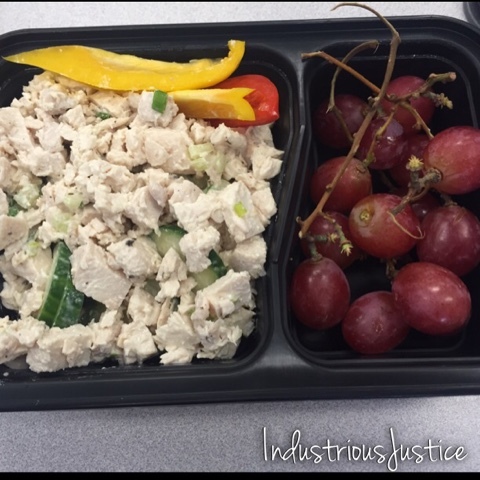 Thirty days of clean eating? Sounds good to me! 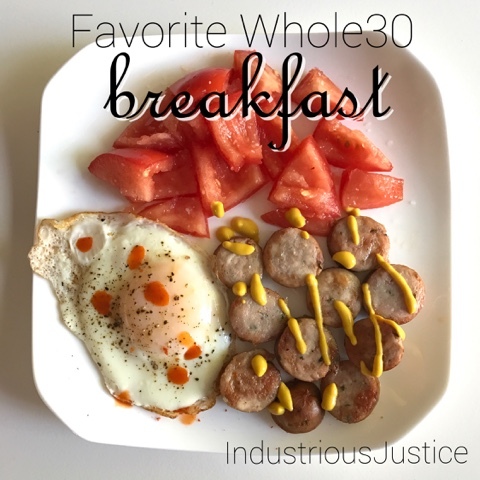 I like planning and rules, so Whole30 seemed like a great fit for me. I mentioned it to my honey and he said he would do it with me. I looked at the calendar and noticed that starting on August 22 would allow us the full 30 days, plus 10 days for structured reintroduction, before our friends' engagement party on October 1. Decision made. Let the Planning Begin: I purchased (and read) It Starts With Food and Whole30, as well as America's Test Kitchen's Paleo Perfected. I started mentioning it to family, friends, and colleagues. I started to gather compliant recipe ideas. The weekend before we started, I mapped out our meals for the following week and prepped food, including making homemade chicken broth and veggie broth. Tip #1: Plan... to an extent. I found that a week at a time worked best for us. I would map out the recipes, go grocery shopping, and prep. That left little room for excuses, while still allowing us to change things up week to week. I should note that this was how we started. It worked just fine until our fridge broke. Yes, OUR FRIDGE BROKE A WEEK INTO OUR WHOLE30. Ugh. Luckily, my parents were able to lend us a small fridge, although this still meant that we had to plan (and prep) for just a few days at a time, because of the lack of space. We did that for two weeks. TWO weeks! Nearly half of our Whole30... The good news is that we made it work and we didn't let it ruin our Whole30. Oh, and our fridge is functioning again! Tip #2: Double the recipe. 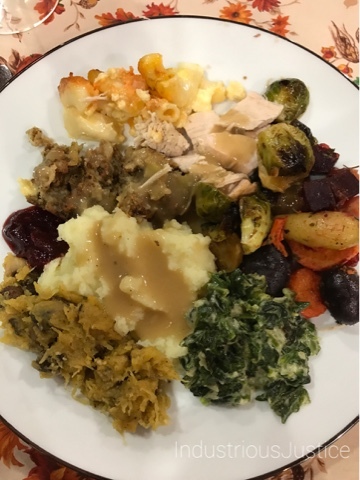 When we found a recipe we loved, and one that is just as delicious as leftovers, we made a big batch and portioned it out for additional, easy meals. Such as Melissa Joulwan's (Well Fed) The Best Chicken You Will Eat. Ever. It really is the best chicken ever and was perfect alongside a simple Greek-inspired salad of tomato, cucumber, bell pepper, and artichoke hearts. Containers are Chefland. Got them on Amazon. Tip #3: Recruit a Friend... or Family Member... or Colleague. Anyone. 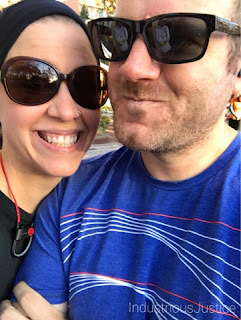 I was stoked that my honey was up for joining me on the Whole30 adventure and that definitely helped keep me accountable. A colleague at work also decided to do it and I cannot begin to express how appreciative I became of her and our nearly daily check-ins about how I was feeling, new recipes, and overall cheerleading. 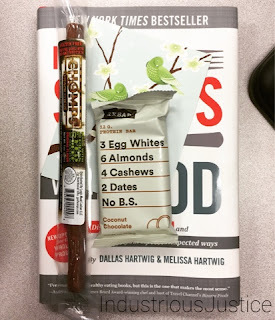 On Day 31, I got to my desk to find my copy of It Starts with Food, along with a Chomp stick, RX Bar, and the sweetest thank you note. Even if you cannot find a buddy who will do the Whole30 with you, at least recruit some supporters. It's important to have support. While I'm happy that those 10 pounds are gone, what matters most is that I feel better. I have more energy and don't experience a mid-afternoon slump. My sleep has improved. I'm still well on my way to meet my next goal of running my first 10K on Thanksgiving morning. Now what? During the last few days of Whole30, my honey and I started to talk more about what we would carry forward. While I have no intention of doing a Whole365, we do have control over the food in our home and our home will remain Whole30-ish. Oh, and the first thing we introduced was wine. Cheers! Tonight, we reintroduce cheese. Mmm... cheese. After a lengthy blog hiatus. I'm back to share about my decision to do a Whole30 and bring my honey along for the ride. We've had friends do it. I follow a bunch of people on Instagram who have done it. I was intrigued. A nutrition reset of sorts sounded good. So I looked into it. I read the books. Not familiar with Whole30*? Here are the basic guidelines, from the website: "Eat meat, seafood, eggs, tons of vegetables, some fruit, and plenty of good fats from fruits, oils, nuts and seeds." The focus is real food. It is straightforward and there is no wiggle room. I like structure and rules, so it works well with my style. Meal 2: Chicken salad (avocado mayo, lemon juice, green onion, celery), cucumber, bell pepper, and grapes. 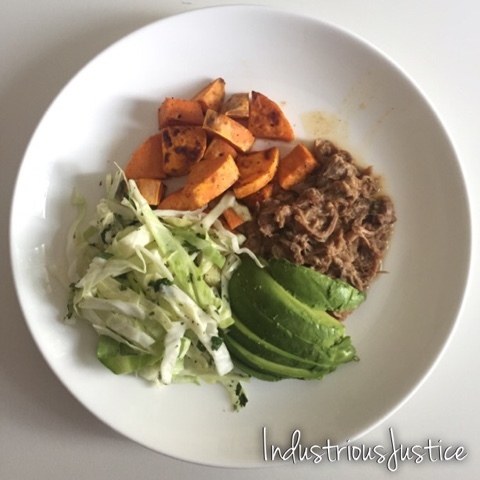 Meal 3: Pulled pork carnitas (Whole30 recipe), roasted sweet potatoes, cabbage slaw, and avocado. How I'm feeling right now... Just fine. I was super tired today late morning. However, I'm not sure I can attribute that to Whole30. Because 1) I got up at 5 am to run 4 miles before my 9-hour work day and 2) I was sitting in a meeting with a lot of talking. Could be those things. Probably. *Want to read more about Whole30? Go here.